A group of friends and I took a trip to Kota Kinabalu, Sabah recently to celebrate Halloween as well as to accompany our dance teacher who was going to conduct several dance workshops. 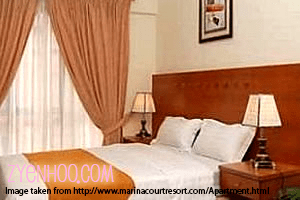 We stayed in Marina Court Resort Condominium, which is an apartment-style hotel. We stayed in a three-bedroomed apartment with two bathrooms, a living room, a kitchen and a dining room. There was a master bedroom with a king-sized bed and ensuite bathroom, a bedroom with a king-sized bed (but no bathroom), and a bedroom with twin beds. There was a shower and toilet which are accessible from the hallway where the bedrooms were lined up. 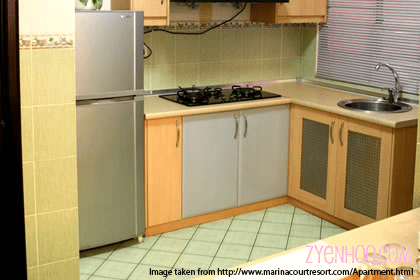 I forgot to take photos of the apartment with my camera, so I’ve taken the following photos of the official website of Marina Court Resort Apartment. The following photos are of a unit that was identical to the one we stayed in (non-seafacing view). The kitchen came with six of everything: six plates, six bowls, six forks, six knives, six spoons, six lotsofotherthingsicantremember. But only one chopping board, one kettle, one wok, and one of other things which we didn’t need six of. We were given a checklist that warned that any missing items will have to be paid for. So I did the checking thoroughly and found that the chopping knife was missing. We didn’t actually need any of the utensils provided because we weren’t going to be doing any cooking during our short stay, but I didn’t want us to be charged for something that we didn’t lose so I called up housekeeping and bugged them until they finally gave us the knife… about 1-2 hours after my first call. Each bedroom had its own dressing table which was useful for us ladies. The lighting was terrible though, so sometimes I had to go to the hallway or the bathroom to ensure my makeup was fine. The beds and pillows were very comfortable, and I slept well throughout the nights. The apartment was actually quite comfortable, and I think it’s quite ideal for a family. But what we didn’t like was the “security measures”. Although there were only five of us, but the unit was actually meant for six and could hold up to eight people… and yet between us, we were given only ONE key. And this one key came with one security card, which was needed to open the magnetic door to the lift lobby of our apartment block. So if we didn’t have the card, we could not enter the lift lobby. The problem was, we were all not going to be together all the time. My dance teacher had to go conduct her workshops, and some of us may want to go to the shops, and some may want to use the swimming pool (in this case, I was the only one). Splitting up like that meant that the card/key would be left with the person(s) inside the room, and she would have to come down all the way to the lift lobby area to open the door for whoever who was coming back later. The receptionists told us that this was for security; and when we complained about the inconvenience, they told us that there would be guards nearby who could help us open the door. Which kind of defeats the security measure, because that means that they could open the doors for anyone, since they would have no way of determining who were really occupants of the apartments, now could they?? OK, as for the facilities: we didn’t get to explore much since our stay was very short. However I did get a chance to have a dip in one of their two pools (one adult pool and one kiddie pool) which were side by side in the middle of the apartment blocks. Problem was, our apartment block is not one of them. We were placed in an apartment block which was in a completely separate square. 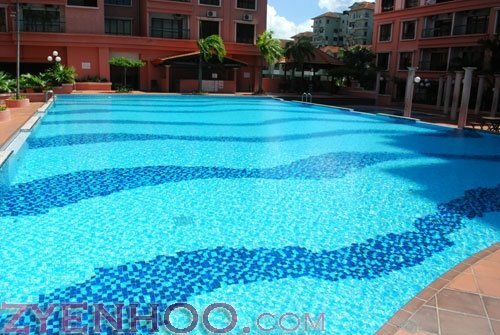 To access the pool, I had to walk from our block across the carpark, through the reception lobby, and into the pool area. In my bikini, mind you. Well, of course I brought a towel along to dry myself after swimming, because towels were not provided at the pool area and there was a warning to “not drip water through the lobby”. Having said that however, the pool was quite a nice size, and well-taken care of. The water was clean when I swam in it, and I had a good workout. They also had deckchairs for people who wanted to suntan themselves. There is also a gym facility at Marina Court, but I did not explore it while I was there. I have to give them two thumbs up. Although they took some time in getting the chopping knife to us as earlier mentioned, they did their best to accommodate our requests. We must have made quite a number of calls because the five of us had different requests at different times, until finally the poor guy who was managing the housekeeping on his own on Friday asked us to group our requests at the same time and explained he was on his own. I-Vee asked them for extra pillows and although they said they were fully booked, they somehow managed to accommodate our request. Our toilets kept getting blocked though, especially the one in the hallway; but the good thing was, they were quite fast in coming over to fix them. Overall, I would have given them four out of five stars if it wasn’t for the “security measures”… hence I give them a total of three out of five stars. Note: I have also submitted my review on Travel Advisor. It’s pretty much the same things I mentioned here, in a condensed version. Check it out!